Santillana del Mar. Posada Araceli. 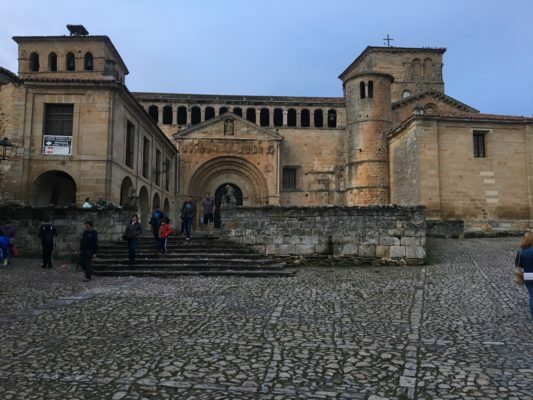 After a leisurely breakfast (again very good) at El Trasmerano, we made our way to our next stop, Santillana del Mar, about 70 kilometres/ 43 miles to the west, bypassing the large port city of Santander (where I had spent a wonderful summer as a student many years ago!). We quickly found our accommodation, the Posada Araceli, fronting a park (Campo del Revolgo) and a short walk from the old town. It has a small, pleasant garden in front, and from the window of our room (203) we looked out towards the countryside. Both bedroom and bathroom were spotless, and there was a small refrigerator in the room. There was limited free parking –for three or four cars– in the Posada’s parking space, but further room around the park. 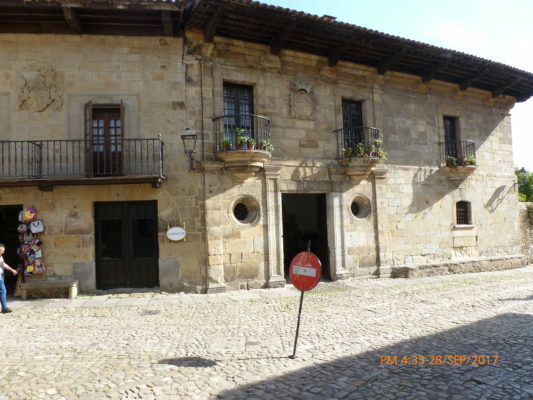 Santillana de Mar (population about 4200) is an ancient town, with a proud and distinguished history. It is an architectural gem with cobbled streets (use sensible footwear) lined with solid, stone manorial houses bearing heraldic shields proclaiming their nobility. Santillana del Mar. Casa de los Villa. The bulk of these sandstone-coloured buildings date from the 14th to the 17th centuries, i. e. from the late medieval and Renaissance periods to the baroque. 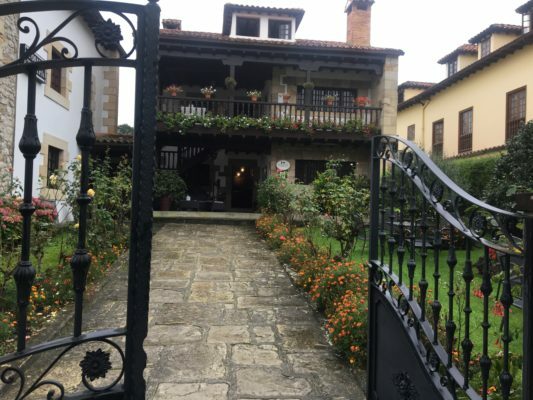 Some have found a new life as cultural centres, museums, municipal offices and exclusive hotels (including a state run parador hotel, Gil Blas). Sharing space with the aristocratic manors are more modest but no less interesting houses with striking, wooden balconies (many flower covered) very typical of the rural architecture of the area. Nevertheless, the architectural star of Santillana is the 12th-century Romanesque Collegiate church of Santa Juliana, after whom the town is named (Santa Juliana giving Sant Illana). The Saint’s remains are said to be buried in a tomb at the foot of the steps leading to the altar (although another tradition says that she is buried in Campana, Italy). To get to the Colegiata (as it is frequently called), you branch to the right shortly after passing through the principal entrance of old town and follow the main street (Carrera Cantón) to its end. The church stands at the very far edge of the town, surrounded on three side by rolling countryside. The colegiata has retained the characteristics of a Romanesque church despite later modifications and additions (e. g. an early 16th-century, ornate Hispano-Flamenco retablo –altarpiece– atop the altar, and a 17th-century baroque pediment above the main entrance under which there is a sculpture/ figure of St. Juliana). 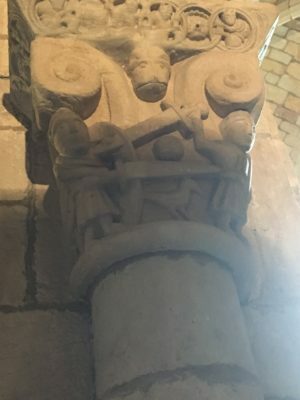 As was customary in Romanesque architecture, there are carvings above the main entrance, on the capitals topping pillars inside the church and atop the slender double columns in the cloisters. Beside being decorative, these carvings were “read” by the largely illiterate faithful of the time, offering them a visual memory aid to the Bible and to Christian ethics. Colegiata. Scene of a fight. Themes touched upon in the Colegiata include the battle between good and evil (often conveyed through allegorical symbols), decorative vegetal motifs, as well as human activity (e. g. a fight between two combatants). The carvings above the main entrance have unfortunately eroded over time, although the figure of Christ Pantocrator (the Ruler of All) is clearly visible beneath the 17th-century statue of St. Juliana. Entry to the church is currently via the cloisters which are reached to the left as you approach the building. Santillana del Mar. Colegiata cloisters. 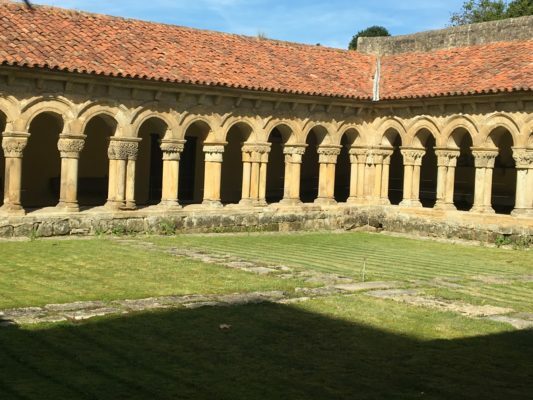 The cloisters have an elegant simplicity with varied carvings atop their slender double columns, and are an excellent example of Romanesque craftsmanship. Inside, the church feels surprisingly light and airy thanks to the uncluttered walls, simple stonework and clean-cut arches. Santillana del Mar. Colegiata altarpiece. 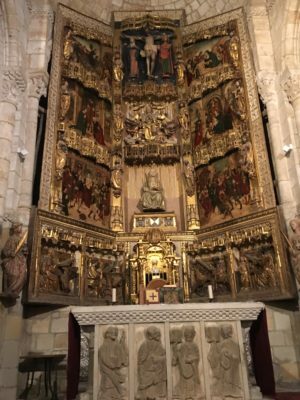 Highlighted in the apse is the richly decorated Hispano-Flamenco altarpiece showing scenes from the martyrdom of the Saint and of Christ on the side rows (or columns) on three levels. The central column is topped by a scene of Christ’s crucifixion, and beneath it an image of St. Juliana and below an elaborate tabernacle (where the consecrated host –communion bread—is kept) With all the decorative wealth covering the altarpiece, it is easy to overlook the anachronism of the clothing which belongs to the late 15th early 16th centuries. In that respect, they serve as an interesting guide to what people wore at that time. Traffic in the historical centre is now restricted to residents and businesses, which makes a lot of sense given the popularity of the town, especially during the summer when it is inundated with tourists. Santillana del Mar. Typical street. The Colegiata is in the background. 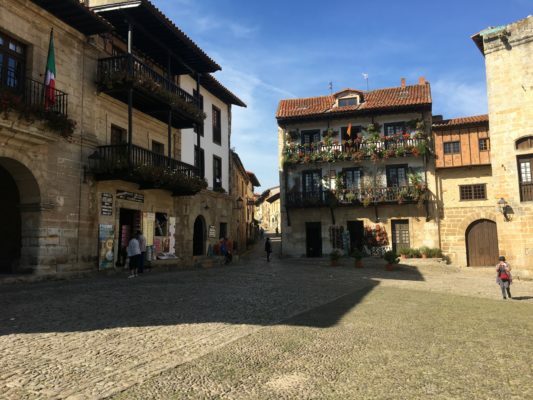 Even in late September, the streets were busy and local shops were doing brisk business selling Cantabrian crafts, postcards and local produce. 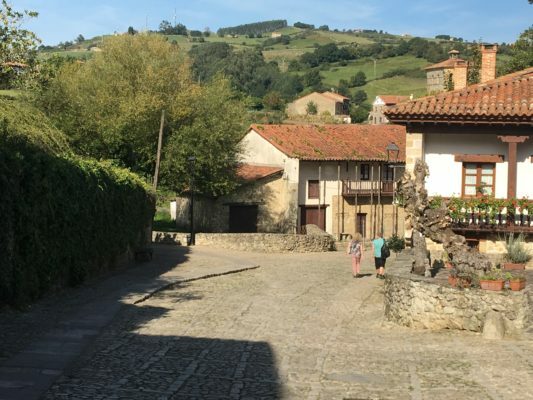 Many visitors jostling with fellow sightseers along the narrow streets would perhaps question Jean-Paul Sartre’s claim that Santillana is Spain’s “prettiest village” (but Sartre wrote his opinion in 1938). One of the consequences of mass tourism has resulted, sadly for me, in the disappearance of one of the greatest attractions of the old town: its rural character epitomised by cows! 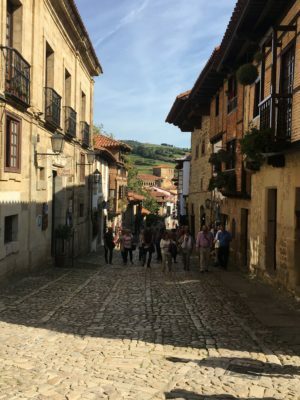 I first visited Santillana in 1959 when it was a sleepy, country village where cows made their way slowly to and from milking twice a day, stopping for a drink of water at a trough on the main street. Alongside the trough was a covered lavadero where women gathered and gossiped while washing clothes in a long, stone channel fed by running water. There are no longer cow “patties” as I observed in another page but the watering trough and lavadero are still there, now more as a reminder of past days, and I noticed that most tourists gave them no more than a casual glance. Tourism is now the main source of income, but the town is surrounded by rolling, fertile fields with farms that provide plenty of milk. As a result, many of the shops that line the streets sell cheese, cottage cheese, and local desserts from milk products (cheese cake, flan: crème caramel, custard: natillas, rice pudding: arroz con leche). After visiting the Colegiata, we strolled round town. Be sure to get off the beaten track and admire the old houses with their wooden balconies, many decorated with a profusion of flowers. Santillana del Mar. Plaza Mayor (Main Square). Santillana del Mar. A hidden corner. You can get a very good map of the town from the tourist office, a little difficult to find but worth the effort: after passing through the main entrance, you are on Santo Domingo. Branch right on to Carrera Cantón, turn first right on to Gandara, cross Jesús Otero and the Tourist Office is ahead of you. It was early evening by the time we had finished our stroll and time to eat. Following recommendation from our posada, we went to El Pasaje de los Nobles with entrances on both Calle Juan Infante and Calle Carrera. It turned out to be a very good recommendation … an excellent dinner, costing 37 euros (including a generous glass of wine each).